On Sept. 6, 1958, the “natural” food movement and chemophobia as we know it were born. On that day, the Food Additives Amendment of 1958, which modified the U.S. Food, Drug, and Cosmetic Act of 1938, came into force. Also known as the Delaney Clause, it stated if a synthetic chemical could be shown to cause cancer in laboratory animals, the chemical must be banned. It also suggested if the exact same chemical was natural, it was safe. While this was immediately attacked as a baffling and unscientific approach to carcinogenicity, many lawyers were looking forward to decades of litigation. As our understanding of the suite of diseases we call cancer has increased, so have the lawsuits. Consumer advocacy groups have made a fortune claiming products like coffee, red dye #2, movie theater popcorn, and Chinese food are harmful because they contain a chemical that caused cancer in rats. Yet no one has been saved by the scaremongering that chemophobia brings. First, rats are not little people; they are a completely different species used only in exploratory studies. They can eliminate hazards in humans but cannot show them—ever. And don’t forget, humans share 50 percent of their DNA with bananas, but bananas aren’t used to create bans, so it makes as little sense to use rats. Second, there were very few known carcinogens in 1958, and IARC, the International Agency for Research on Cancer, would not even come into existence until 1965. Today, California’s Proposition 65 has 900 chemicals alone that statisticians think might lead to cancer. As a result, there are warning labels on everything from coffee pots to corkboards in, of all places, hospital cancer wards. The ridicule by the public started as early as the lawsuits. That’s because in November 1959 the Delaney Clause claimed its first victim: cranberries. During the month leading up to Thanksgiving 1959, Arthur Flemming, the Secretary of Health, Education, and Welfare, declared that because the FDA detected traces of the weed killer aminotriazole (C2H4N4) in some Ocean Spray cranberry products, these products needed to be banned. Since chemophobia scaremongering was not common at that time, the public wasn’t yet jaded and believed cranberries must be as harmful as cigarettes and radiation since the federal government issued a warning. 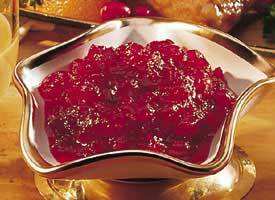 Schools dumped cranberries into the garbage and restaurants took them off menus. Sales of canned cranberries plummeted 80 percent and Mamie Eisenhower, the first lady, made a public display of serving applesauce at Thanksgiving. Yet to the science community, the worry was over nothing. Aminotriazole did sometimes create a thyroid issue, which could cause cancer in rats. But the dose required to do so was equivalent to a rat consuming 15,000 pounds of cranberries, every day, for its entire life. The public quickly figured out this was ridiculous and politicians capitalized. During a presidential campaign stop in Wisconsin, Vice President Richard Nixon had four helpings of cranberries that tested positive for “contamination.” Not to be one-upped, his opponent, Sen. John F. Kennedy, drank two cranberry juice cocktails. Nonetheless, the die was cast. As a result of the Delaney-induced cranberry scare, “fear entrepreneurs” emerged and so-called “careorism” became a paid occupation. And thanks to increasingly precise detection methods and the use of statistics, hundreds of chemicals would prove carcinogenic in animals and receive bans, if they were not already naturally found in a particular food. Chemophobia over “synthetic” versus “natural” chemicals is still so prevalent today that to make a point, the American Council on Science and Health publishes a science lover’s Thanksgiving Holiday Menu each fall. It highlights popular, common dishes and the cancer-causing chemicals each contains that have been misleadingly associated with studies resulting in a rodent fatality. For example, organic turkey contains heterocyclic amines, which are rodent carcinogens and mutagens. Free-range beef prime rib also contains this—plus benzene and psoralens, which have killed plenty of rats. Vegetarians fare no better. Organic celery has the rodent cancer-causer caffeic acid, broccoli has allyl isothiocyanate, and potatoes have solanine, arsenic, and chaconine, along with caffeic acid and ethyl alcohol. But the public is told chemicals are okay if those rat-killing cancer causes are natural. In reality, they are okay whether they are natural or not. While activists still trot out new claims, which include BPA and Roundup weed killer, government scientists see through this chemophobia because they aren’t bound by political manipulation of the evidence. Consumers should be just as skeptical. When there are claims of hypothetical hazards, they should keep a simple four-word question in mind: Where are the bodies? By now, products that truly cause cancer, like cigarettes, are well-known. Everything else is people selling you something natural. This article was written for Food Quality&Safety maqazine. Read it here.